She has an athletic build with a tan complexion. Mollie was last seen wearing gym shorts, a black sports bra and running shoes. She was last seen jogging around the cornfields, this is something she did every evening. She was suppose to have dinner with her mother but never showed up. The Brooklyn community has rallied around Mollie's family handing out flyers in the area and continuing searches. 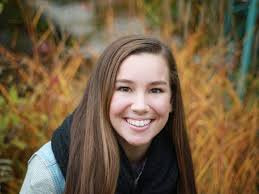 Investigators hope information from Mollie's fit bit will provide some information. Mollie was staying at her boyfriend's brother's house at the time of her disappearance. She was dog sitting while her boyfriend, his brother and his brother's fiance was out of town for work. Mollie's boyfriend received a snap chat from her around 10pm that night. Investigators have searched her social media and fit bit, but so far have not released their findings. As always, my prayers are with the Tibbetts family. We pray for Mollie's safe return.